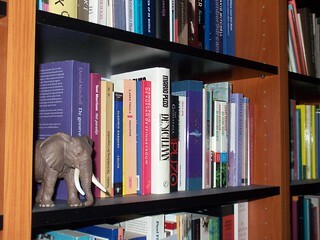 Home » Elephant Post: Law Librarian Bloggers… Tell Me Something I Can Actually Use! In case you’re wondering, it was November 28, 2011. That was the last time we rolled out the Elephant Post here on 3 Geeks. However, there was a message in my email in-box this morning that made me think that it might be time to travel into the Elephant Graveyard and resurrect the platform one more time and cover something important as a Parade of Elephants. Therefore, we trot out the Elephant Post one more time. Nina lists a number of topics that she thinks are important to the law librarian profession, but are not covered extensively enough by the bloggers within the profession. I think there are some legitimate reasons why some bloggers do not go deep into some of these subjects, but let’s see what we can do as a group and share some thoughts on some pretty important issues. What technology will help get us through these changes? What staffing, research resources, services, processes, etc. will we need to have in place? How we will need to deal with licensing, copyright, budgets, marketing, management, and other issues that face administrators within law firms? How will library education need to change? So we will take Nina’s challenge and see if we can crowd source some of the possible answers, in the old Elephant Post style. For those of you that may not remember how it works, we offer you a few ways to post your responses. First of all, you can simply pick one of the questions and email me directly (xlambert at gmail dot com) with your response. If you’d rather just jump in and answer one of these directly, then you can edit the embedded form below, or go to the Google Docs site directly and fill out the form. I’ll pull these together throughout the week and post the results at the end of the week. If we get really good responses, we may post those up separately as a stand alone answer.